The guy that helped us out most with our windows was the guy we ordered them from. His name is Howard and he's the man! 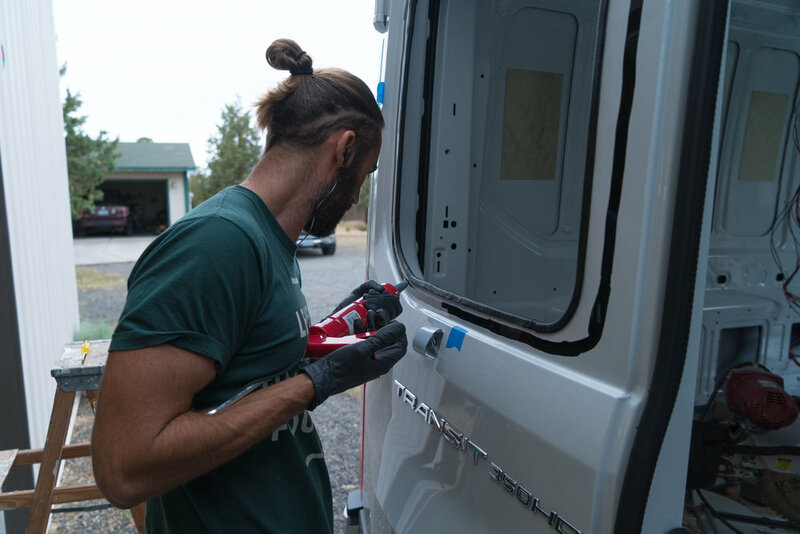 Be sure to go check out www.van.glass and check out his window selection, as well as tutorials on how to install. He also has some really amazing YouTube clips where he goes through the entire process and gives amazingly helpful tips. What's especially helpful for us were his notes on how to tap out the desired area to install a window with a hammer and awl (or, step one that's outlined below). Another note on ordering, please tell Howard you need everything for the install. He'll include items such as glass cleaner, urethane, primer and even send you an example of how to cut the tip to apply the urethane. Talk to Howard, he'll hook you up. By writing out this post, we just want to add our experience here to give more info/photos. But his is where we started! He was a great help and the windows are beautiful. So go check his stuff out. Make sure to be extremely cleanly. When you're finished cutting/filing/sanding your metal, clean up all the metal bits. When you're cleaning your windows before applying adhesive, be extra, extra clean. Debris, oil, dust or anything else can affect the seal. Be patient applying the window trim. Going slow and taking your time can make the finish look nicer. Apply the "correct" amount of urethane. Not too much, not too little. Watch videos and ask questions. Too much can mean cleaning up urethane where you don't want it. Too little can mean you don't seal your window properly. Check out Howard's notes on how to tap out the proper shape with your hammer and awl. This part is super important and we want to leave it to the expert advice. As you'll see in his photos, the red line is the one that they recommend you using for your cut because it results in cleaner finish (with his windows). Whereas the yellow line may result in something funkier. To get the red line that he proposes, follow the yellow line first. To do this, follow the inner sheet metal cutouts all the way around. To get the red line, measure 3/4" past the yellow line where they diverge. Pretty self explanatory. Just trace around the tapped out section you made with the awl. Make sure it's pretty exact so that you have a snug fit. You can see Richmond marking out 3/4" past the sections he hammered in the places where the lines diverge. Again, please see the instructions on van.glass for exact instructions here. This is so that you don't damage any of the paint around the cut that you make. Make sure to put extra on the corners where the jigsaw will swing wide. Don't worry about the inside piece, since this will soon be scrap metal. Drill close to a corner and make sure it's large enough to fit your jigsaw blade in. Richmond is drilling his pilot hole here and will step up to a larger bit to make it big enough to fit the jigsaw blade. 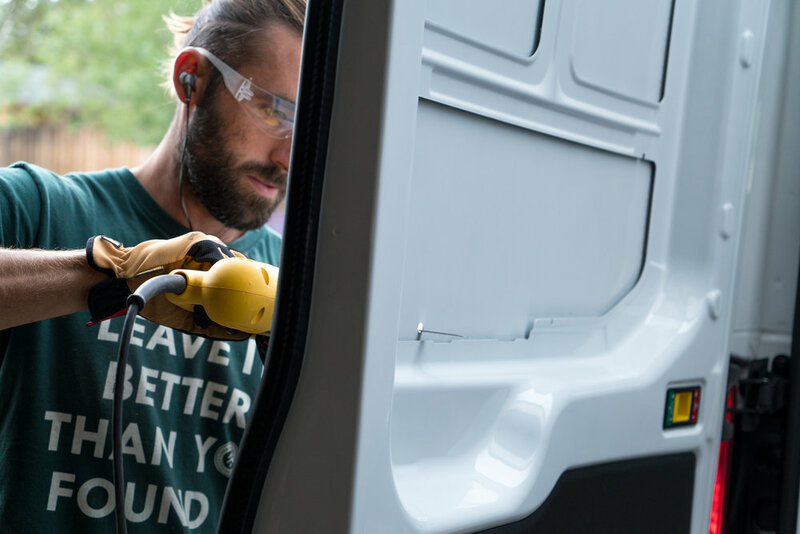 If you haven't cut into your van yet, we recommend starting with the ceiling fan. This cut is a bit more difficult and much larger. For portions of this cut you'll be cutting through two pieces of sheet metal and there are some places where there is excess spray foam insulation that you'll burn. Use a "clean" metal cutting jigsaw blade if you have one. The best tool to use here is a center cutting shear (we don't have one of those). If you don't have a jigsaw, you can also use a sawzall, but it's a bit more difficult to make a clean cut. Follow your marked cut line. Start slow and plan ahead for the corners. Wear your ear and eye protection. 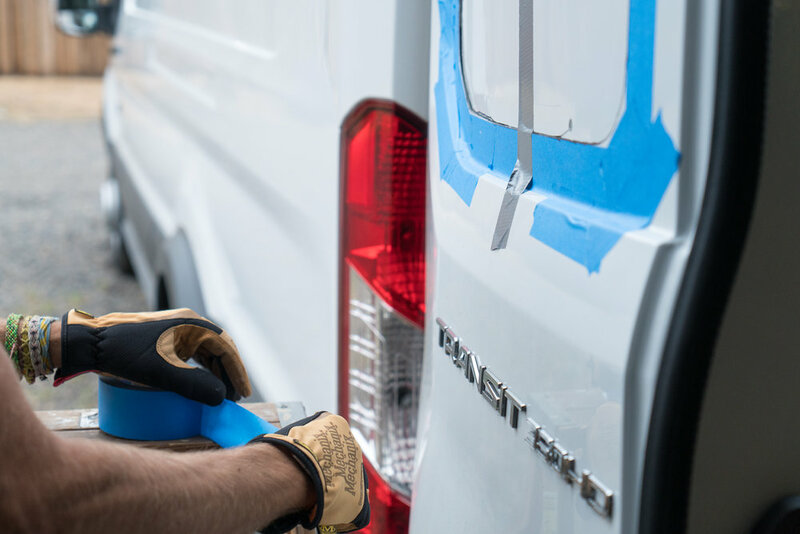 As a precaution, add duct tape after you finish each side so that when you complete your cut, the piece of metal you've cut out doesn't fall on your head or worse, your brand new van. Make sure it's secure! If you aren't wearing gloves here, be careful! The metal can be very hot to the touch and can have burrs or other sharp pieces of metal on it. Place this piece aside as it'll probably be recycled. So that there are no sharp edges and no mess, use a file to file down the edges of the metal. This is good practice with any kind of metal cutting. Shards aren't your friends. After you've knocked off all the large pieces, go along the edge with a piece of sandpaper as well. You may find some sharp bits remain! Get all of these metal shards! The jigsaw is a great tool, but creates tiny pieces of metal that go everywhere. These are the starting points of rust issues. Vacuum everywhere you can. You'll find bits in very odd places! Go along the edge of your cut and apply paint. If you buy the entire kit from Howard at van.glass, he'll include a small self-etching primer with your order. 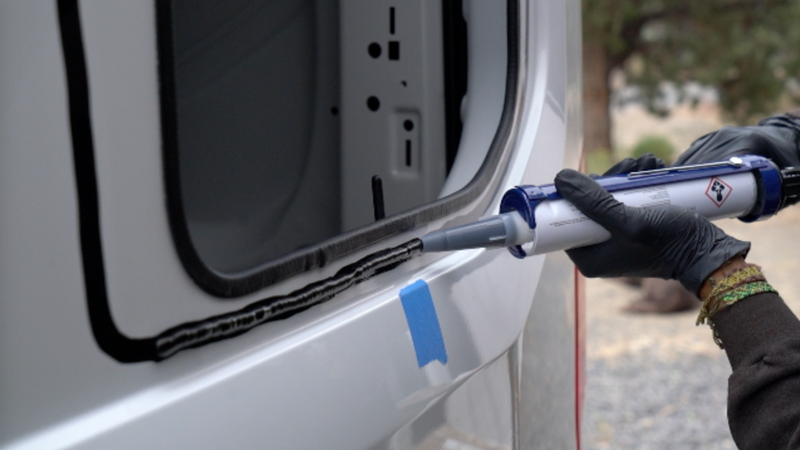 Any self-etching primer or all-in-one paint for metal will work fine. This step is optional, but another way to prevent rusting later. Make sure you confirm that the edge trim is included in your order. There are lot's of tips included in this YouTube video. Some extra tips - go slow. Make sure that you've seated the trim all the way down before continuing. If there are portions where you feel like you're forcing it, stop. Check the trim and make sure it's open enough. You can use a flathead screwdriver to start opening the trim for the wider sections. When going around portions with two sheet metal pieces, go even slower. We messed up slightly on the first trim, mostly because it was dinner time and Richmond was hungry, so he rushed. It's still fine, but you can see the difference between the first and the second trim install, so just take your time and don't get frustrated. Place your window exactly where you want it and mark at least three points. We did this by pushing the window against the opening exactly where we wanted it and applying masking tape to three edges. Once we were happy with it, we cut the masking tape leaving parts of it on the van and parts on the window. Later, when we're placing the window in for real, we'll be lining up the tape placement. You can also see pieces of duct tape ready to apply to the window after it's placed in it's final location. This is to keep it from moving after it's installed. We also used a couple quick grip clamps to hold it in place too, but after talking with Howard, it seems like those are unnecessary. This picture was taken after the primer was applied, but shows the tape in the correct locations. Use the GC-800 glass cleaner on the surface where the window will go. Again, I'm going to point you to YouTube to see the master at work. He has a great description about where and how much to scuff/dull the paint. Use the same glass cleaner and clean your surface yet again. If you're nervous about being clean, you're probably not being clean enough. Clean more! And yet again, I'm going to point you to YouTube to watch Howard apply the primer. He's got more great tips. One thing I'll add is that a little of this stuff goes a long way. I made sure not to have too much primer on the dauber to prevent dripping. Make sure your workspace is well ventilated and if you're inside, wear a mask. This stuff smells like cancer. Use the glass cleaner to clean the inside of your window. Might as well do the outside while you're there. You'll have about 10 minutes to kill before the primer is dry. Use your scotch brite pad to scuff the window at about where it will line up with the primer once the window is in. Again, follow Howard's instructions on YouTube as he's got way more insight and experience than we do! Clean the inside of the window again. Yes, this is repetitive, but necessary. You should see a bit of black on your paper towel from the Scotch Brite. Once it's clean enough for Howard, flip your window so that dust doesn't land on the inside of the window. Make sure you use a heavy duty caulk gun here. You can see Richmond struggling to get the adhesive to flow using a medium duty gun in the first picture. The second picture shows an easier application with a heavy duty gun. This stuff is like tar. If it's cold you may want to warm the urethane a tiny bit before applying. We are once again going to point you to Howard for the full instructions. Another tip on the urethane. Make sure you apply enough, but not too much. Try to get it as evenly spaced as possible. If in doubt, go slightly thicker. We went a touch too thick on the first window, which required a little urethane clean up on one edge. It was annoying, but only took about 10 minutes to clean. On the second window, we did a touch too little and that was hard to fix. 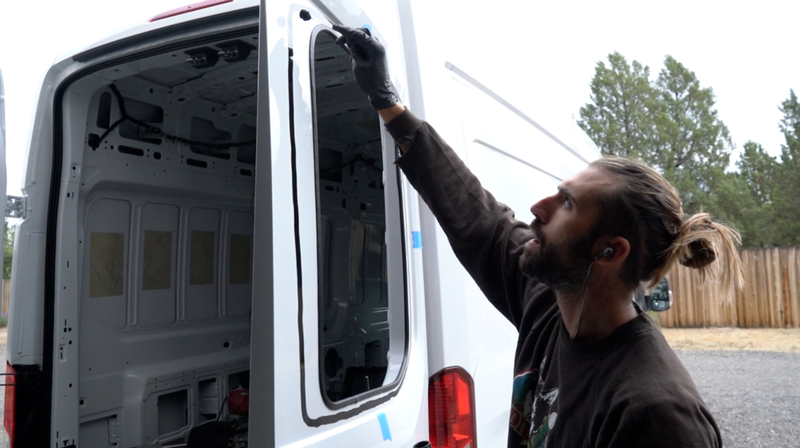 We ended up using a straw to apply adhesive between the window and van after it was installed. This didn't work very well, so we sealed the edges with marine adhesive sealant. Time will tell if this was a good or bad plan, but that's how we fixed it. Don't be us. Apply the right amount. Here is where you use the masking tape to press your window into place. It doesn't have to be perfect on the first placement, but get it as close as you can. Once it's in you can move it a little to get it to line up perfectly. This just helps make sure that there's no movement while the urethane is drying. No need to really clamp down, but make sure that it's not going to move. Good practice with anything like this. Excuse the photo quality below and above. Both are screen grabs from videos that we didn't end up using! Give your window time to dry once it's all clamped up! And you're all done :) enjoy your beautiful view out the back!! Congrats on the beautiful windows!!!!! Enjoy all of the glorious light and polarized views. We love these things. Again, to check out a great selection, visit www.van.glass and check out Howard's awesome tutorials. Portholes: The where, how, and why?